Quantitative light-induced fluorescence (QLF) (QLF-clin, Inspektor Research Systems BV, Amsterdam, Netherlands) (Figure 7) was developed for use in caries detection and it is available commercially for clinical use. This device consists of a handheld intraoral color microvideo CCD camera, interfaced with a personal computer and custom software (QLFpatient, Inspektor Research Systems BV, Amsterdam, Netherlands). The software enables to capture and to analyze in vivo images of the tooth during clinical examination. QLF uses a 50-watt xenon arc-lamp and an optical filter in order to produce a blue light with a 290- to 450-nm wavelength, which is carried to the tooth through a light guide fitted with a dental mirror. The fluorescence images are filtered by a yellow high-pass filter (A > 540 nm) and then captured by a color CCD camera (Al-Khateeb et al., 1997). When the tooth surface is illuminated by this high-intensity blue light, autofluorescence of the enamel is obtained by the intraoral camera, since all excitation light reflected or diffused is filtered. When a lesion is present on the surface, an increase in light scattering is observed relative to the surrounding enamel. The result of this is that the contrast between sound enamel and a carious lesion is improved with the lesion seen as being dark on a light green background (Neuhaus et al., 2009). 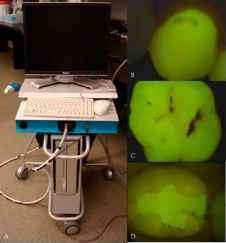 To enable calculation of fluorescence loss in the caries lesion, the fluorescence of healthy tissue that was originally present at the lesion site is rebuilt by extrapolation of the fluorescence of healthy tissue that is found around the caries lesion. The difference between the lesion values and the reconstructed values allows the calculation of fluorescence loss. The fluorescence emitted is directly related to the mineral content of the enamel. Thus, the image can be used later to quantify the size, depth and volume of carious lesion produced by the parameters produced by the software: lesion area (in square millimeters), lesion depth - AF (percentage of fluorescence loss) and volume of carious lesion - AQ (the product of the lesion area in mm2 and the lesion depth in percentage of fluorescence loss) (Zandona & Zero, 2006). Through these parameters, it is possible to detect and differentiate caries lesions at an early stage of development, making this system a sensitive method for quantification of enamel caries. 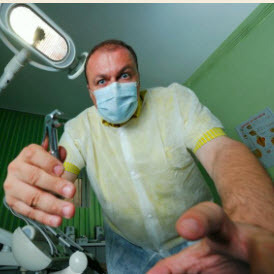 Another advantage is that the image can be stored and used to motivate patients to seek healthcare and to prevent dental disease through education during routine preventive care. However, this method is more complicated, since the use of QLF consists of three main steps. The first is lesion detection by the examiner and subsequent capturing of an image of the lesion. Second, quantitative analysis is done of the image. Finally, the third step involves the long-term monitoring of the caries lesions, which enjoys the benefit of an innovative video repositioning part of the software, setting the initial image and the live image based on the geometry of similar fluorescence intensities. For that, it is necessary that the images of the tooth surfaces should be captured in the same position and angulation. Thus, same magnification images obtained at different observation times could be compared (Buchalla et al., 2001). applicability, such as detecting incipient primary lesions, secondary and root caries on smooth and occlusal surfaces in both primary and permanent teeth; detecting demineralization around orthodontic components; monitoring demineralization and remineralization caries lesion processes; quantifying dental plaque, erosion and fluorosis; monitoring caries removal; and detecting removal of extrinsic stains after tooth whitening (Al-Khateeb et al., 1997 ; Eggertsson et al., 1999; Neuhaus et al., 2009 ; Zandoná & Zero, 2006). However, it is important to emphasize that QLF can be influenced by some factors, such as stains, dental plaque, dental fluorosis or hypomineralization. Thus, as the presence of these confounding factors can produce images with similar appearance to that of dental demineralization, it is important that dental professionals should recognize those factors and differentiate them to perform a correct diagnosis. QLF device has demonstrated potential to detect and longitudinally monitor caries lesions. In addition, it can provide dental professionals with significant information related to caries lesions severity. However, it should be emphasized that the information provided by QLF, as in all supplemental methods, can never be used by itself for clinical decision support. This information should be carefully evaluated and integrated to other individual patient factors and professional experience before making a definitive diagnosis and treatment plan.